Heads up that The Woodwright’s School operated by none other than the man himself – Roy Underhill has recently released their 2015 class schedule. Why do we bring this to your attention? Simply because Roy and his associates conduct some amazing woodworking training classes and we wanted to give you all a heads up on this matter. Here’s a picture for your enjoyment of Nick attending a previous 3 day long “Making Bench Planes with Bill Anderson” class at The Woodwright’s School. As you can see by the picture, Roy has his magnifying glass out inspecting every detail of Nick’s planing technique while Bill Anderson is amazed by the whisper thin shavings that Nick is cranking out. Bottom line, a great group of guys and an A Plus rating for the knowledge that is provided at this famous North Carolina school. Therefore, if you are in the market to gain some great woodworking knowledge and meet some fantastic folks we can strongly recommend The Woodwright’s School. 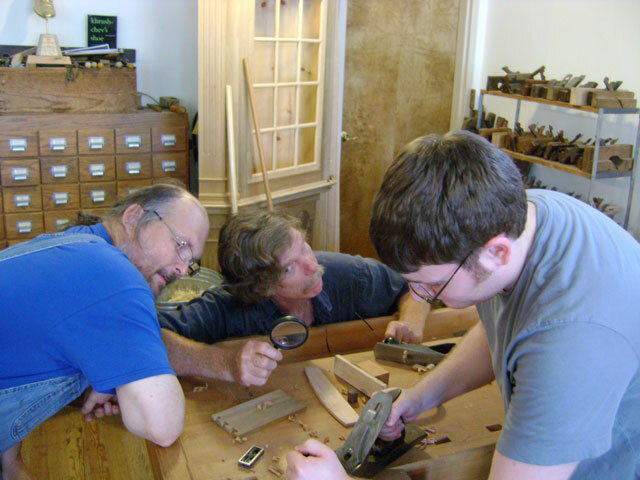 Also, don’t forget to check out the 3 day “Making Bench Planes w/ Bill Anderson” class and the 5 day “Moravian Workbench w/ Will Myers” class – two of our absolute favorites.